In the 1960 movie adaptation of H.G. Wells' The Time Machine, the hero-- H.George Wells-- returns home from a far-flung future to retrieve three books with which to rebuild humanity. The movie ends with the question, "Which three would you have taken?" I have often pondered this question, and come up with everything from The Joy of Cooking to How Things Work and Gray's Anatomy. 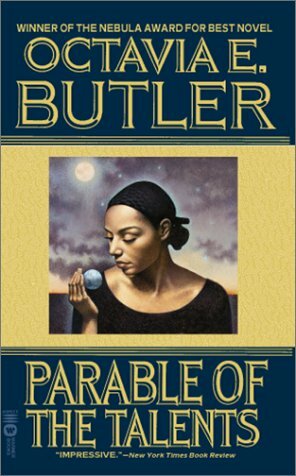 Over the holidays, I reread Octavia Butler's groundbreaking Earthseed novel, The Parable of the Sower. In it, and the sequel, Parable of the Talents, a rising presidential candidate named Senator Andrew Steele Jarret runs on an ultra-conservative platform with the slogan, "Help Us to Make American Great Again." Talents, which includes the above slogan, was published in 1998. The Huffington Post talks about it here. And if you follow my tweets, you'll know Ms. Butler had more to say on the subject of governance, as she reads from her work on Democracy Now. I've always thought of science fiction as the moral compass for humanity. SF writers project the future so we can plan and course correct in the now. As Lauren Olamina says in the Earthseed books, God is Change, and Change can be shaped. Which got me thinking about those three books in The Time Machine. Wouldn't it be a wonderful idea to give books to each incoming presidential administration? Story is a powerful way to voice concerns, to share ideas, to explain a point of view. So, this year, I'm starting a book club for the new administration. Once a month, I'll suggest a book for the new cabinet to read. I'm open to your suggestions. Tweet me ideas, or comment on this blog. I thought about listing all 12 books here and now, but I think we need to give the future a chance to unfold before we know what books would serve best next. That said, I've got four suggestions to start the year off. Synopsis: When unattended environmental and economic crises lead to social chaos, not even gated communities are safe. In a night of fire and death Lauren Olamina, a minister's young daughter, loses her family and home and ventures out into the unprotected American landscape. But what begins as a flight for survival soon leads to something much more: a startling vision of human destiny... and the birth of a new faith. Next month, we'll continue with Parable of the Talents. Sadly, Ms. Butler passed away before she could write the third book in the series, so her vision of the future only goes so far. Which, on the bright side, means we get to write our own.